Welcome to our new series about understanding product specifications. Our goal in these articles is to help you understand what the amplifier power ratings mean when you start to compare solutions. We’ll not only explain which numbers are good, but we’ll include a detailed description of what each specification means, how it’s measured and how it affects what you hear or experience. To start the series, let’s look at amplifiers. It’s a subject we’ve chosen because people tend to focus on amplifier specifications more than anything else when shopping. Without a doubt, the most popular specification that consumers look at when purchasing a car audio amplifier is its power rating. An amplifier takes the small signal from your source unit and increases it in voltage and current to drive a low-impedance speaker. In a nutshell, the more power you have, the more loudly you can play your car stereo system before the signal going to the speakers distorts. The limit of how much power is required is determined by the power handling specifications of the speakers in the vehicle, their cone excursion limits and their distortion characteristics. We’ll look at those limits in a future article about speaker specifications. 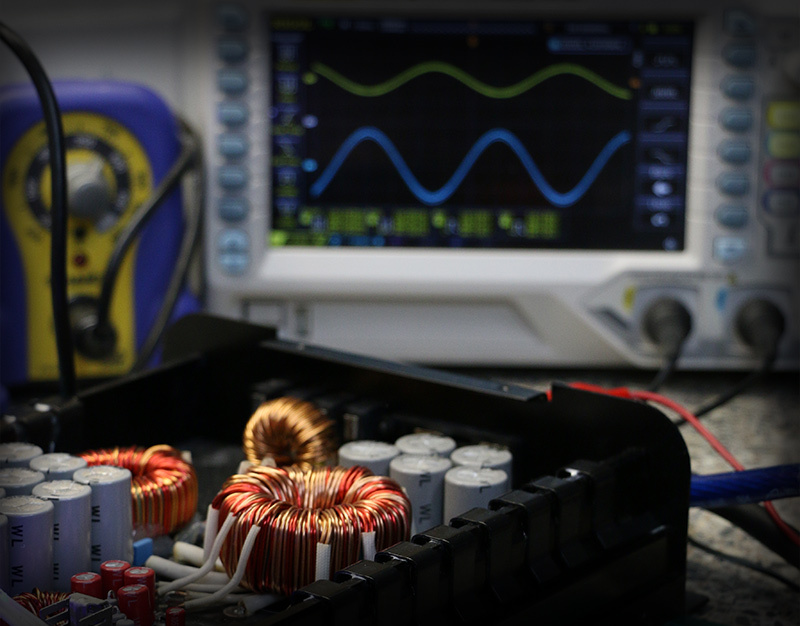 When an amplifier is set up in a lab to measure power, it’s typically connected to a power supply and a set of load resistors. Many manufacturers use test equipment from companies like Audio Precision to measure the distortion characteristics of the output signal to determine the point at which you would hear the distortion. The graph above shows the distortion of two channels of a five-channel amp relative to their power level. The blue trace is one of the four main channels and produces about 95 watts of power at 1 percent distortion. The red trace is the subwoofer channel and shows that the amp produces just under 300 watts at 1 percent distortion. The Consumer Technology Association (formerly the Consumer Electronics Association) has established a standard for the power and signal-to-noise ratio measurements of car audio amplifiers called CTA-2006-B (formerly CEA-2006-B). The specification states that power measurements are to be taken with the amplifier powered with a voltage of 14.4 volts, and the measurement is taken into a specified load (typically 4 ohms) with no more than 1 percent total harmonic distortion and noise, across the entire bandwidth of the amp. In layman’s terms, the amp must perform as well producing bass as it does high-frequency information, and the specified power rating cannot include large amounts of distortion. While the 14.4V rating is somewhat high, it establishes a level playing field from which consumers can compare results. Several companies include additional power measurements to highlight different characteristics and performance features of their products. JL Audio, for example, includes output power ratings tested at 12.5 volts. Rockford Fosgate includes dynamic power ratings taken using the IHF-202 standard. Essentially, the dynamic power rating demonstrates the reserve capacity of an amplifier’s power supply to drive transient signals that last no more than 20 milliseconds. If you don’t see the CTA-2006 logo associated with a product you are considering, there are several ways that the numbers may not be directly comparable with other options. One easy way to inflate numbers is to increase the supply voltage to the amp. Depending on the design of an amplifier’s power supply, each additional volt provided to that power supply could theoretically increase the amplifier’s output by about 0.6 dB. That would be like a 100-watt amp being able to make about 115 watts. Not specifying a distortion rating is another great way to fudge the numbers. Most Class AB amps can produce 60 percent to 70 percent more than their 1 percent rated power if they are driven hard into clipping. Of course, the music no longer sounds like music and you run the risk of damaging speakers because they’ve been over-powered. Finally, some amplifiers have problems with producing power at the extreme ends of the frequency spectrum. To be compliant with the spec, the amp needs to make the rated power level at 20 Hz through 20 kHz, or whatever the upper limit is for the design. Do Amplifier Power Ratings Really Matter? If you are shopping for an amplifier, the power rating does nothing to tell you about the quality of one amplifier compared to another. You don’t need 100 watts to drive your tweeters and you certainly won’t be happy with a 25-watt amp driving a subwoofer in your car. When you are comparing amplifiers, don’t get your knickers in a knot over a few watts. This applies specifically to amplifiers that come with birth certificates (documentation that states a particular amplifier’s power production capabilities). You can’t hear the difference between an amp that makes 300 watts and one that makes 305 watts. That difference would be a mere 0.07 decibels. You will hear a difference between a subwoofer amp that produces 100 watts and one that can deliver 300 watts. We’ll add a note about “how things work” here. To increase the output of your audio system by 3dB, you need an amp that can produce twice as much power. So, to go from 90 dB in your car, you need twice as much power from the amp to raise the volume to 93dB and twice as much again to get to 96dB. When it’s time to go shopping for a car audio amplifier to provide more power to your speakers, drop into your local car stereo shop and speak with one of their product specialists. They can help you determine how much power is appropriate for the system you have in mind and choose an amp that sounds great and works with your budget.